When removing the fuel-fi ller cap, loosen the cap slightly and wait for any hissing to stop, then remove it: Fuel spray is dangerous. Fuel can burn skin and eyes and cause illness if ingested. Fuel spray is released when there is pressure in the fuel tank and the fuel-fi ller cap is removed too quickly. Before refuelling, stop the engine, and always keep sparks and fl ames away from the fi ller neck: Fuel vapour is dangerous. It could be ignited by sparks or fl ames causing serious burns and injuries. 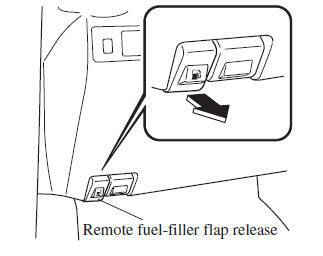 Additionally, use of the incorrect fuelfi ller cap or not using a fuel-fi ller cap may result in a fuel leak, which could result in serious burns or death in an accident. Do not continue refuelling after the fuel pump nozzle shuts off automatically: Continuing to add fuel after the fuel pump nozzle has shut off automatically is dangerous because overfi lling the fuel tank may cause fuel overfl ow or leakage. Fuel overfl ow and leakage could damage the vehicle and if the fuel ignites it could cause a fi re and explosion resulting in serious injury or death. Always use only a designated Mazda fuel-fi ller cap or an approved equivalent, available at an expert repairer, we recommend an Authorised Mazda Repairer. The wrong cap can result in a serious malfunction of the fuel and emission control systems. To open, pull the remote fuel-fi ller fl ap release. To close, press the fuel-fi ller fl ap until it locks securely. To remove the fuel-fi ller cap, turn it anticlockwise. 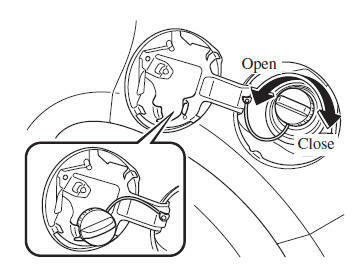 Attach the removed cap to the inner side of the fuel fl ap. To close the fuel-fi ller cap, turn it clockwise until a click is heard.